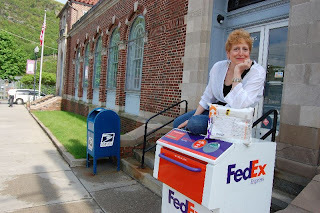 DEBORAH CROMBIE: I've been fortunate enough to know Crescent Dragonwagon (if you're curious about the name--and who wouldn't be--you can read about it HERE) for almost twenty years. 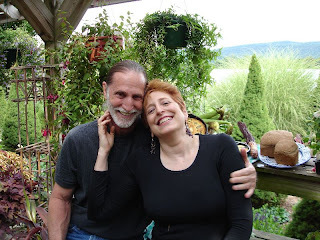 She was, once upon a time, the best of all innkeepers at a magical place called Dairy Hollow House in Eureka Springs, Arkansas, which is where we met, but in the years since our paths have crossed in several strange and interesting ways. Crescent now lives in Vermont, and I'll let her describe herself for you, as I couldn't do it better. "Your basic ultra-prolific trans-genre'd writer (novels, children's books, cookbooks/culinary memoir, poetry) who also leads workships in which participants go from I've-always-wanted-to-write-BUT into fearless action. Plus, makes one hell of a rockin' cornbread. It's dragonisma!" And she is brilliant at all those things. I've been cooking from Crescent's Dairy Hollow House Soup and Bread Book almost as long as I've known her. It's my favorite cookbook, and I've given it to everyone I know who cooks. (And some who don't, in hopes that they will.) So I think we'll start with the cookbooks, and expand from there. DEBS: Can you tell us about the new cookbook coming out this year? On the other hand, much more. Deb, my deep fondness for beans has its roots in my early days as a home cook and a young, newly-on-my-own frequently impoverished freelance writer. That there could be an ingredient which was so inexpensive yet so reliably satisfying, and so amenable to diverse incarnations --- soup, chili, salad, side-dish, even dessert --- was a great discovery for me. Not only could I eat well for not too much money, I could entertain and feed others, which as you know, is something I've always loved doing. Eventually a skinny little cookbook, my second, grew out of -it. It was Workman Publishing's first cookbook. It was called The Bean Book, had a spiral binding, and retailed for $2.45. This was 1972. I was 20 when it came out. Fast forward 39 years (and they did fast-forward). Along the way I became, among other things, an ardent gardener (legumes are the one agricultural plant family which actually enriches, rather than depletes, the soil in which it grows), a vegetarian (protein! ), an innkeeper in a part of the country which reveres beans and cornbread. I also kept growing as a cook and a traveler; Indian, Asian, African & European winds blew through my kitchen. 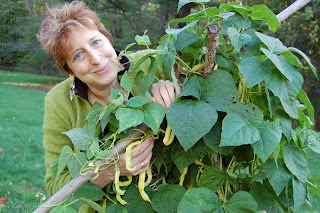 Bean by Bean is a cornucopia of all this: as with all my cookbooks, they're seasoned with lore, how-to, anecdotes, silliness (the sidebar 'Beans That Aren't" includes not only coffee, chocolate, and vanilla beans, but Mr. Bean and jelly-beans), memoir... and recipes. Also as always: I fall in love with the ingredient or dish I'm focused on, and just keep on discovering and reinventing. Beans are generous, as a plant and as an ingredient (I just roasted a few pounds of them from my own garden, with garlic and tomato, and froze them last night, for the winter). I hope to infuse those who read and cook from the book with this sense of generous possibility. And it's with Workman, who did the first one so long ago. DEBS: The soups from the Soup and Bread Book that are the staples in our house are the bean ones! Especially the Black-eyed Pea Soup. Fabulous. And the Skillet Sizzled Cornbread. Oh. My. The best ever. But before I get out my cast iron skillet, let's talk about the new children's book. I've had a peek at the illustrations, and they are gorgeous! This is my first picture book in nearly a decade, so I'm thrilled. It's also my first ever with Little, Brown. DEBS: AND can you tell at least a bit about Fearless, as I think our readers will love it. We have a lot of aspiring writers who read the blog. CRESCENT: Basically, participants discover --- experientially, as they write over the weekend; not just abstractly --- how to use uncomfortable feelings, such as fear, anxiety, uncertainty as forces to power creation, rather than stop it. As Jerri Farris, who's taken Fearless twice, said, "Now I laugh at my limitations on the way to work. " Nothing is Wasted on the Writer: Living, loving, writing, reading, thinking. Listening, tasting, sniffing. Cozying up to mystery at midlife. I think we're all part of the narrative life tells itself. Deep Feast: writing the world through food: if you want answers to the big questions (identity, life, love, death), start by talking to your dinner. Oh, yeah: recipes, too. I'm addicted to both. Hope you all will be, too! Deb, you have the most interesting friends! Welcome Crescent! I can't wait to get my hands on those cookbooks. I cook a lot of no-meat meals, much to my husband's dismay. So interesting that you've managed to have a wide variety of books published--that's inspiring! What a wonderful interview. My sons gave me Crescent's Vegetarian cookbook several years ago and we all use it frequently, but always wondered about her name. Loved this post! Over the years I've cooked more and more without meat and with lots of fresh herbs. I just hopped over to Amazon to order some of the cookbooks (yay, beans!) but I couldn't find the children's book. Where can I get it? I loved the snippet from it. One of the things I love about hanging out here is discovering new writers to read and new blogs to follow. Thanks, Deb and Crescent! I wish I could do the bean thing, but they seem to destroy my stomach and I give up. Are some easier to digest than others? Is there some trick to cooking or eating them that helps? Cresecent, love the Dairy Hollow book! Such yummy soups and those little bitty muffins that disappear like magic! And since my hunny's last name is Beans (of the clan McBain! ), well, we might have to have the Bean Book! Nothing is wasted on a writer - so true! Fabulous blog, girls. LOVED this!! Welcome, Crescent - What wonderfully interesting books you've written. And Thank you, Debs for the introduction to such an interesting woman. I'm off to learn more. So sorry to have been off-grid today--but then, it's only 7 pm in the US, right? Crescent, you are fab, as always, and it's such a treat to introduce you to people who don't already know you! And Jan, I've found Crescent's approach to beans works wonders--my solution? Eat hummus every day! I would live on beans, olive oil, and garlic. I wish we'd been able to put up one of the illustrations from All the Awake Animals--gorgeous! I have all Crescent's children's books and they are amazing.